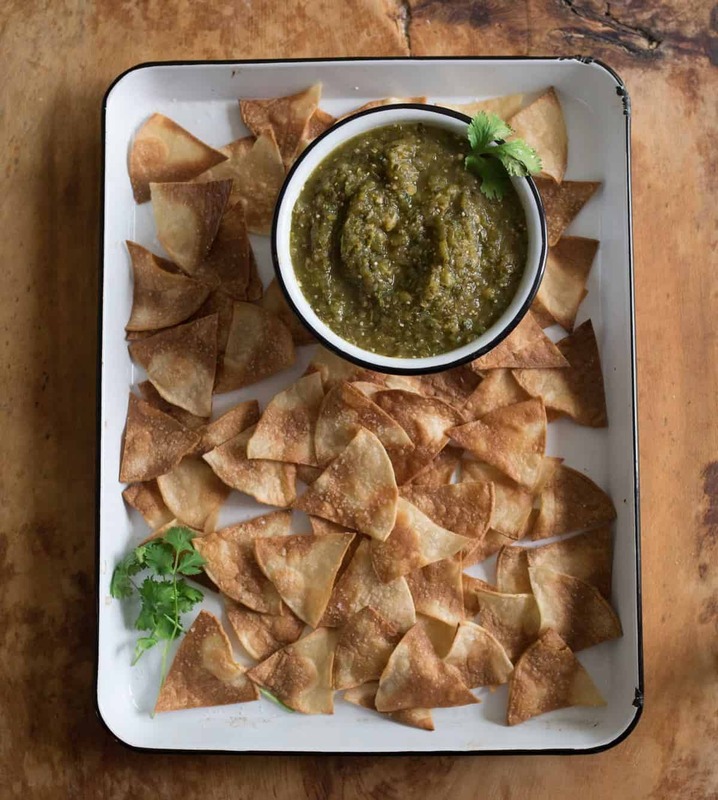 Quick and easy salsa verde recipe made with oven roasted tomatillos, peppers, onion, and garlic all blended to salsa perfection with a mix of herbs, spices, and lime juice. 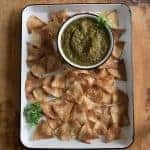 Simple salsa verde is one of my all time favorite recipes to make because it’s so simple but it adds so much flavor to just about anything you serve it with. Don’t get stuck thinking that this is just a condiment for chips. This salsa is so great served on tacos, mixed with a little sour cream for my famous easy chicken enchiladas, and used as a marinade for your taco meat! 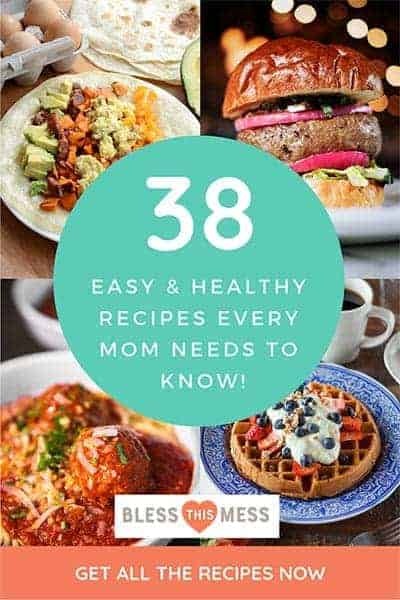 It’s great on salads, oven roasted veggies, pasta salad (like this creamy taco pasta salad, just add ⅓ of a cup to the dressing recipe! ), and cooked black beans. 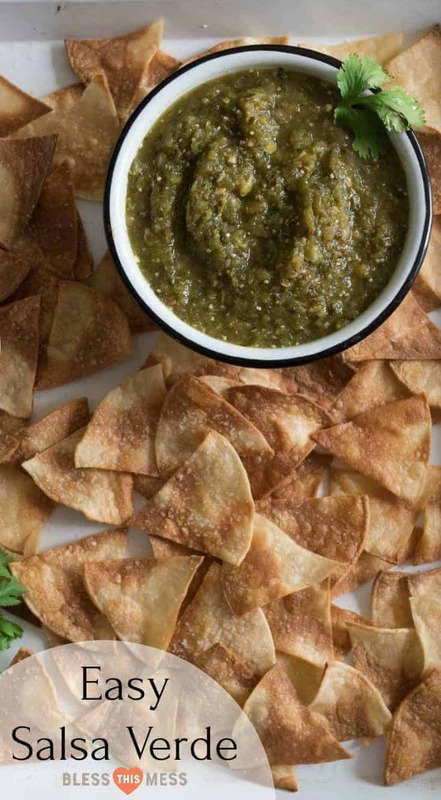 There might be some new-to-you ingredients in salsa verde, so let’s chat about them. Tomatillos: Look for ones that have an intact and light green husk. The older they are, the more brown the husk gets. Poblano peppers: These peppers are actually pretty easy to find and are normally sold near the other hot peppers in the produce section. They are super dark green, pointed, and at least the size of your hand. Look for ones that are glossy and bright on the outside. The heat can vary a lot on these, I’ve found. I generally consider them medium in heat. If you’d like your salsa mild, remove the seeds and seed membrane for the poblano peppers and omit the jalapenos all together. If you like a medium salsa, remove the seeds and seed membrane from both the jalapenos and the poblano peppers. If you like a hotter salsa, keep the seeds in both peppers. If you like really hot salsa, add a few other hot peppers to the mix like habaneros. Keep leftovers in a sealed container in the fridge for up to a week or in the freezer for up to 3 months. When tomatillos and peppers are in season, late in the summer, I always make large batches to freeze for later in the winter. This is one of those magic sauces that is so much more than a green salsa. 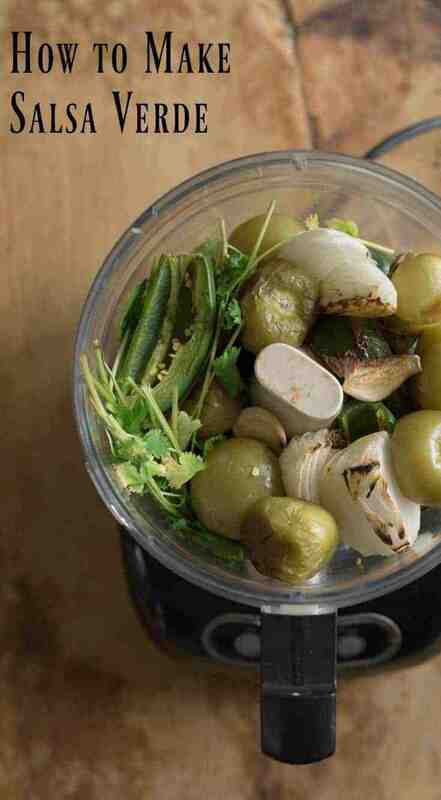 Use it as a marinade for chicken and pork chops (I just add a little chicken stock or water to thin it out), cook your protein in it for tacos (pressure cooker or slow cooker both work great), or add a little olive oil to it to make a delicious salad dressing. It’s so full of flavor – put it on everything! You can line your baking sheet with parchment paper for easier clean up if you’d like. Remove the husks from the tomatillos and rinse them lightly to remove the sticky residue. Cut the peppers in half and remove seeds as you see fit (the more seeds and white pith you leave inside, the hotter the salsa will be. 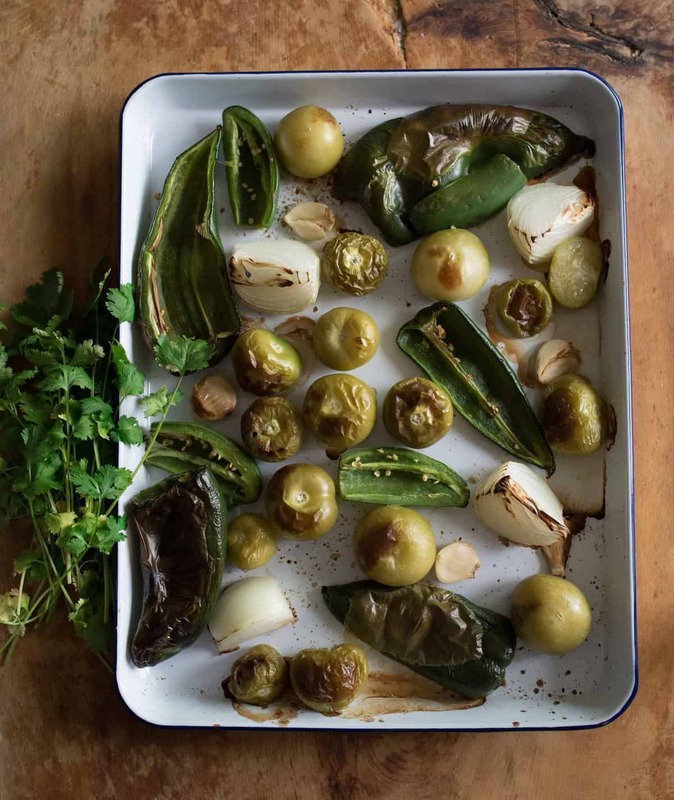 Add the tomatillos, onion, Anaheim peppers, jalapeños, and garlic to a large rimmed baking sheet. You can line it with parchment paper for easier clean up. Bake for 20 minutes until the veggies soften and start to char. Remove from the oven and allow to cool for a few minutes. If the poblano peppers skin is bubbled and blistered, feel free to remove any skin that will come off easily. Don’t worry about any that is still stuck on the pepper. 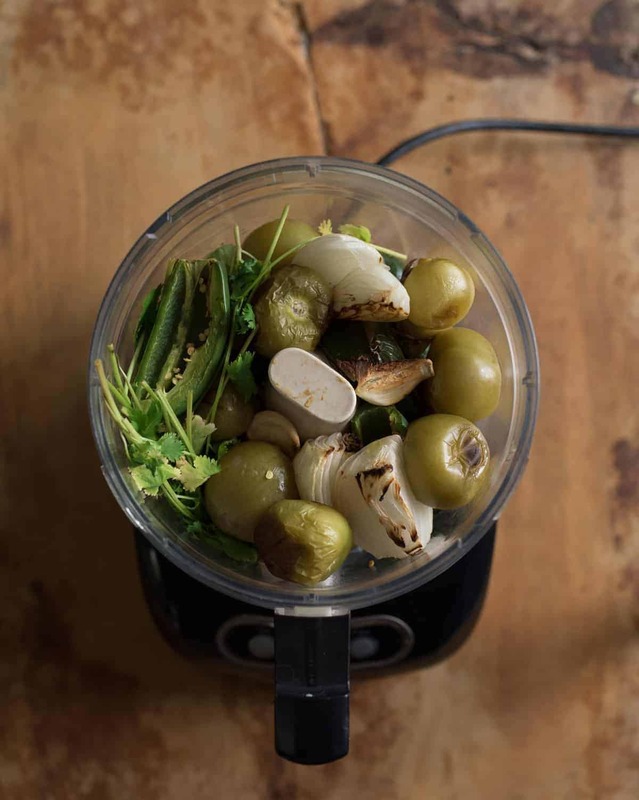 Place all of the roasted vegetables in a food processor or blender, working in batches as needed, and blend until lightly chunky. Add the cilantro and blend until well incorporated. Add the salt, sugar, cumin, and lime juice and process just until combined. Take a taste on a tortilla chip and adjust the salt, sugar, and cumin to your liking, stirring well if you make any changes. Enjoy right away. Keep leftovers in a sealed container in the fridge for up to a week or in the freezer for up to 3 months. This recipe freezes great. Store in a freezer safe container for up to 3 months. I can’t wait for you to make this one, friends. 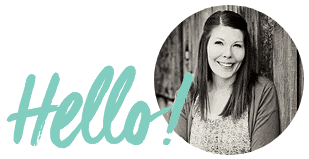 It’s a recipe I make over and over again, and I’m so pleased to finally be sharing it with you! And that’s just to name a few. If you can’t tell, I have a thing for Tex-Mex and Southwestern flavors!